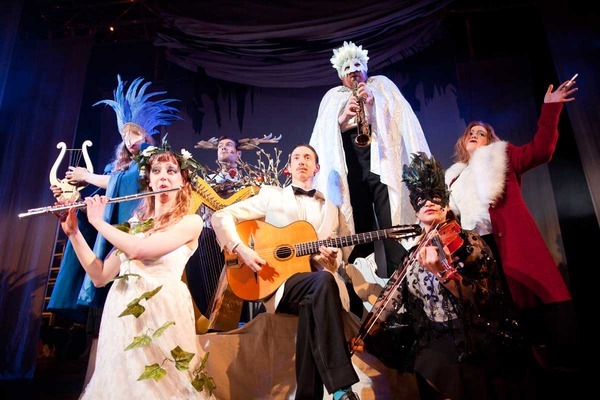 I like to see myself as rather a connoisseur of London’s more leftfield theatre scene and the description of the Little Bulb theatre’s take on the classical tale of Orpheus’ ill fated descent into the underworld sounded far too out there to miss. Greek myth, meets opera, meets Django Reinhardt, Edith Piaf and 1930’s café culture promised to be quite the spectacle. So last night I made my own descent to southwest London and the BAC where I met with my good friend Miss Dessiner. We were both a little unsure of how this somewhat surreal medley was going to work out. However, from the moment that “Django”, our Orpheus for the evening, strummed his guitar strings and French Songstress “Yvette Pepin”, in the role of Eurydice, began to sing we were absolutely transported. Hot club jazz, French Chanson and opera blended seamlessly together. Emotions ricocheted from the hilarity of a forest full of exceptionally camp dancing animals, to the poignancy of a male Persephone pleading the case for the lovers in a haunting falsetto (one of those should have been ridiculous but was quite the opposite moments). Performances from Django, Yvette and the supporting chorus were at once polished perfection and guilelessly joyful. It was all in all quite the creative tour de force. At the end of the show Miss Dessiner and I felt like we had been on quite an epic journey ourselves and were exhilarated and exhausted in equal part. There was nothing for it but to consume several glasses of vin rouge in the French café tradition to bring us back down to earth again! The Cast of Orpheus; weird, wacky and wonderful! This entry was posted in Mistress about Town on April 3, 2013 by Miss Myers.